The e-commerce delivery business is helping the less-educated enter the formal workforce - a stepping stone to a better career. It is the morning before Christmas. 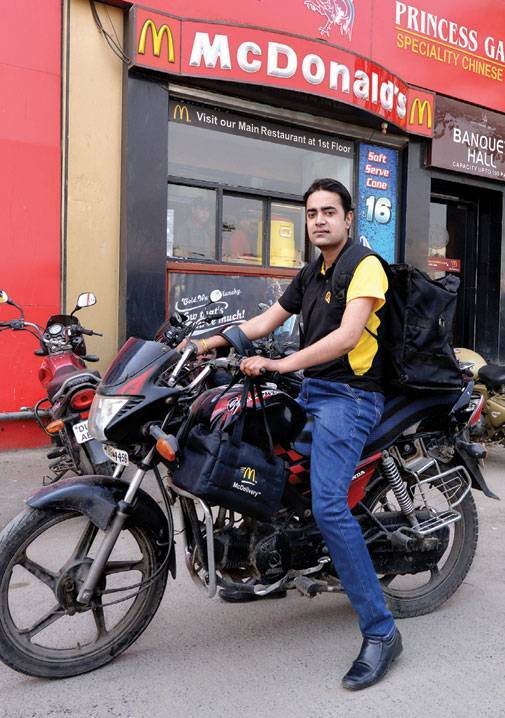 On-demand delivery company Quickli's small hub in Delhi's Kalu Sarai is abuzz with 10 just-hired men. They get red jackets and Santa hats for a "feel-good factor". There aren't any holidays - when the rest of India celebrates, delivery companies must work. Right now, everyone is gearing up for a training. Trainer Arpo Ghosh switches on a projector, as the men take their seats. The next one hour is about a lot of must-dos and must-haves. "Always keep Rs 1,500 in cash for spot payments." "The mobile needs to be fully charged and 3G connection is a must." "The GPS should be switched on". "If you accept an order and then reject its delivery, Rs 50 gets cut from the pay." A sermon on grooming standards and soft skills follow. "When you ring the bell at a house, wait between 40 seconds and one minute before ringing again if the door isn't opened," tells Ghosh, as his trainees watch him quietly. "Maintain a physical space between the customer and you; if you are delivering a cake, the left hand should be below the packet; when you are returning change, make sure you do not touch the customer's hand." The 10 men will need to go through multiple mock tests to polish up these skills, re-skill and up-skill before the rubber of their two-wheelers meet the road. The way they look, what they speak, and how they behave have become increasingly important in making them employable in this crucial last-mile job of India's $17-billion e-commerce industry. There is no physical touch and feel with the brand, like there is in a bricks-and-mortar store. And there is no e-commerce until the product purchased online is delivered or the cash collected. The delivery boy, in many ways, becomes an extension of the brand, its physical embodiment. "You might advertise and have Aamir Khan or Shah Rukh Khan as brand ambassadors, but the point is, the guy at the door is my brand. That determines my experience of companies such as Flipkart. If the organisation is smart, punctual, energetic, empathetic, courteous," says Sanjeev Duggal, CEO & Director of Centum Learning, a corporate training firm. There are about 100,000 delivery boys working for around 20 established e-commerce, hyperlocal and traditional logistics companies today delivering an estimated 1.5 million packages every day - everything from electronics to furniture to grocery and food. Besides third-party companies such as Ecom Express, Delhivery, Roadrunnr, Parsel and Quickli among many others, there are in-house delivery set-ups of Flipkart, Myntra, Amazon, and Snapdeal. The number of people this industry hires could explode in a few years. By 2020, e-commerce is expected to be a $100-billion industry, a more than eight times growth over 2015. The manpower growth may not keep pace because of productivity improvements, but it is still expected to jump five times to half a million delivery jobs. That's part of the story. Sahil Barua, CEO and co-founder of Delhivery, points out that for every 2.7 riders the company employs, it has one employee in an operational function. The e-commerce supply chain, he estimates, will end up employing 800,000 to a million people by 2020. The larger companies today claim to reach far-flung PIN codes in the country. 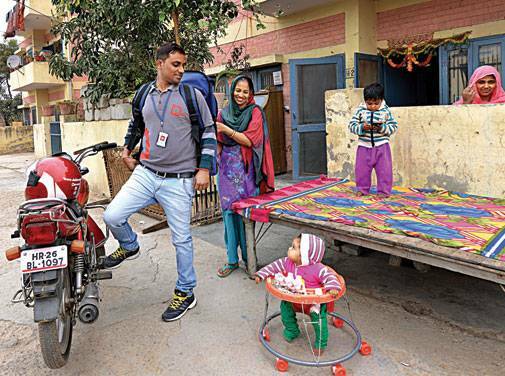 Delhivery covers 350 towns and cities, while Ecom Express says it is delivering in 500, from Bomdila in Arunachal Pradesh to Old Srinagar, where one of its delivery boys barely managed to escape a terror attack last year. About 50 per cent of the firm's orders are delivered in tier-III and tier-IV towns. Delivery jobs, therefore, are being created across the country. That's a potential balm to two pains: rural-to-urban migration and the bane of unemployment itself, among the less-skilled. "In the age group of 21-35, there are about 100 million people who are underemployed or ill-employed in India with low skills and poor education," Chairman of Manipal Global Education and Chairman of FICCI Skills Development Forum, Mohandas Pai, estimates. "These are largely in the north and the east of India where education delivery is weak as also skill development." The rising consumerism that comes with seeing others having cars, nice offices, going to restaurants and people spending is impacting those underemployed or unemployed. In many cases, the young are resorting to violence or are trying to get politically active. "They believe that by reservation, they will be entitled for jobs. That's why you have the Patidar agitation in Gujarat, the Gujjar agitation in Rajasthan or the Jat agitation in Haryana. That is where the challenge rise," Pai adds. The ballooning of delivery jobs, along with those of security guards (India needs 300,000-400,000 every year) and drivers (nearly a million every year, including truckers) can address that challenge, providing well-paying jobs to the bottom of the pyramid. Chandravir Singh is 25 years old and recently joined AskMe Grocery as a delivery boy, delivering everything from pulses to medicines. He is from Aligarh in Uttar Pradesh and migrated to Noida three years ago, in search of a job. In Noida's Raipur Khadar village, he shares his rented one room with two friends who work as security guards. Even Singh was a guard till five months ago. Guarding offices was a 12-hour job that paid him Rs 10,000. He didn't have holidays. If he skipped work, his employer pared his pay. AskMe Grocery promised improvements. He currently makes Rs 16,000 with incentives. The company pays for his provident fund (PF) and employee state insurance (ESI). He gets a day off every week. After paying the monthly room rent of Rs 2,500, he can now remit Rs 8,000 to his family. His parents, wife and two children continue living in Aligarh and are his dependants. It's a cold winter morning. The sun has just cut through the fog. Singh sits on a rope-weaved chaarpaie outside his room. "Last month, I bought a 23-inch LED television," he says. His landlady sits nearby, smiling at him. Singh switches to talking about his role. "I can communicate better now. I think I can do marketing because I keep talking about my employer all the time." Singh's story underscores a few things. His quality of employment has climbed a few notches because he is picking up communication skills, a stepping stone to potentially more lucrative jobs, going ahead. Staffing company TeamLease thinks delivery boys can move into retail, sales, and customer-support jobs. Second, Singh's employment as a delivery boy was a lateral movement, from a different industry. So a fresh delivery job was not created in this case. However, he has transitioned from an informal job where he received no pension or insurance benefits to a formal job. This ensures minimum wages and proper documentation of benefits by the employer. Importantly, formal jobs are required to ensure dignity of labour. "We need formal jobs simply because it changes the future of our youth like no amount of subsidy or an informal job can," Rituparna Chakraborty, Senior Vice President at TeamLease, says. "It assures them dignity of labour, guarantees social security benefits, a minimum wage, enables them to improve their productivity with access to formal training and skill development opportunities." Sudeep Kumar Sen, Assistant Vice President of South & East at TeamLease, says that most of the delivery jobs are in the formal sector and are largely employed through professional staffing companies. "The folks will be hired by either of us, i.e., the logistics company or TeamLease Services. They are put on our payroll; we take care of the HR administration activity like onboarding, release offer letters, process payrolls, their statutory compliances, and insurance management," he explains. That is one model of employment. Some companies, such as Ecom Express, prefer formal employment but on the company's rolls. "We have seen the advantage of having our own staff in comparison to outsourced staff. The benefits include assured career path. In turn, this brings in commitment towards the organisation," says Sanjeev Saxena, a director in the company. The third model is the 'gig economy' model where companies treat riders as freelance contractors and are paid per job done. It could be contractual employment, but with an attractive pay scheme. Roadrunnr is one company that believes in variable pay. "The idea behind variable salaries for delivery boys was driven by our mission to breed microentrepreneurship and offer thousands of people flexible working hours, either of which would not be possible by having people on a fixed salary," says Mohit Kumar, co-founder & CEO of Roadrunnr. "Also, the variable component gives them complete control of their earnings, which can be increased significantly by working more consistently." On an average, most of the full-time riders make Rs 18,000-25,000 a month and the part-timers make Rs 10,000-14,000, the company says. The potential to earn higher wages have increased because of the growing use of technology by delivery companies. Quickli, for instance, uses predictive analytics to deploy riders to an area where they can forecast demand before it originates. If the pick-up time is minimised, it allows riders to execute more orders, earning more. According to TeamLease, the average pay of a delivery boy has jumped from Rs 12,000 per month to almost Rs 20,000 in one year. That is a 67 per cent jump in salaries - a figure many companies dispute. Delivery companies say it is more in the range of 15-30 per cent. And those who doled out liberal hikes may have died an untimely death. "Yes, there was a period when there were a number of hyperlocal start-ups with a million dollars in venture funding. They blew it all up by hiring delivery boys at Rs 20,000 a month," says Barua of Delhivery. "Most of the older companies in the space realised that you don't need to pay Rs 20,000, because you have to run a company as well." Wages are likely to moderate in 2016, as the e-commerce industry goes through a churn. Jobs will be lost. Indeed, companies may be planning to lessen the impact on its employees. Nevertheless, salary surveys are yet to reflect any such impact. Aon Hewitt's annual salary survey, released in February this year, pegs salary increase in the e-commerce sector to be at 15.6 per cent in 2016, the highest among 19 industry segments and ahead of life sciences, media, and hi-tech. But, is the industry creating net job growth? The higher pay has created incentives for lateral shifts. But TeamLease's Sen also thinks there is a net growth in opportunities. "Between September 2015 and January 2016, a minimum of 50,000 additional opportunities were created in this segment alone," he says. Often, the delivery boys are today sourced from semi-urban and rural areas to cater to the demand from metros. Sandeep Shinde is 21, but hasn't studied beyond standard X. His father is a sugarcane farmer in Kolhapur, about 376 km from Mumbai. Shinde migrated to Mumbai a year ago, saw a newspaper advertisement by delivery company Russsh, applied, and landed the job. This writer meets him at Bandra station. He has to deliver a hairdresser to an address in Varsova. We take the local train to Andheri West, before boarding bus no. 251 to Varsova. It is a stop by the sea. A brisk walk of seven minutes will take us to Arshie Complex, the delivery address. 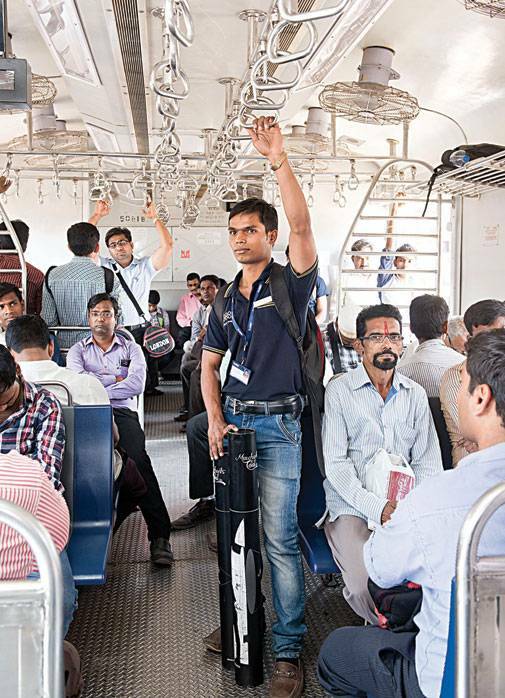 "This is the fastest way to reach Varsova from Bandra," Shinde explains. He doesn't ride a bike. So far all his deliveries, which include cakes, clothes, and cheques, have all been by travelling on public transport. The delivery is uneventful. A lady in a black top and black pyjamas receives the hairdresser, pays Rs 200, smiles, and shuts the door. Not a word is exchanged. "We don't need to communicate too much," Shinde tells this writer as he picks up his black and red backpack, and leaves the complex. He plans on completing standard XI and XII. With the money he earns and saves, he can re-start his education next year. Shinde isn't exactly using the money in his pocket to buy televisions and refrigerators. But there is a possibility better pay can fuel consumption from those at the bottom of the pyramid. Right now, many delivery boys, like Shinde, are using their rising pay cheques to pursue higher education, educate their children, and spend on family health care. Amit Jindal, for instance, is using his pay to help fight his father's tongue cancer. 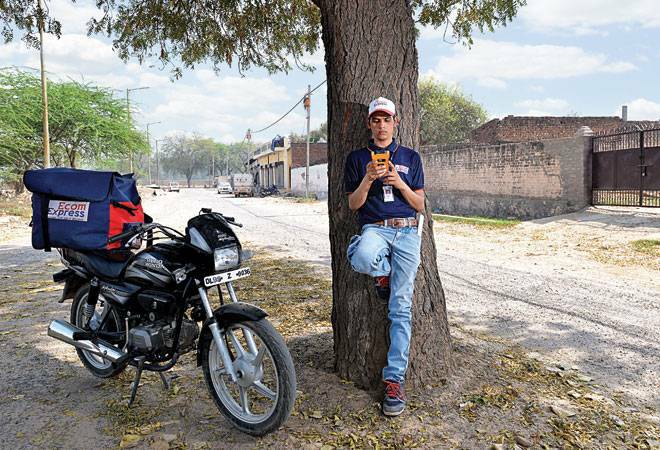 He explains the nuances of a good conversation to this writer as we go for a delivery on his bike, this time in Delhi's South Extension. Jindal works for Roadrunnr and has picked up an order from McDonald's. He will deliver it to a house in the area's P-Block. "Saying 'Madam, khana laya hoon' (I have got food for you) isn't polite. We say 'I'm from X company. I have come with your order.'" Jindal must be good at what he does - he makes up to Rs 23,000 a month. The burgers are for a house on the third floor. Jindal, who is wearing a dark blue and yellow T-shirt, brown pants with neat brown shoes, parks his bike by the road and takes a claustrophobic lift to the door. A pot-bellied man is waiting and is surprised to see two people. "Is he also from Mc D?" "No. He is from Business Today. He is writing on delivery boys." The man remains expressionless; takes the packet, pays, and closes the door. On the ride back, Jindal talks about stressful moments at work. Once the customer he was delivering to was drunk and wanted him to come inside the house. "I said I am not allowed to cross the door; he started abusing." There was yet another occasion when he pressed the wrong doorbell at 10.30 in the night. "An older man answered the door and threw a fit, saying he would call the police." Automation and robotics is in. 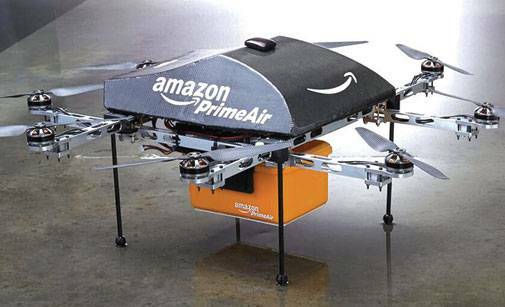 Amazon's Prime Air could be the future of delivery: the firm says it is designed to safely get packages to customers in 30 minutes or less using small unmanned aerial vehicles, or drones. This could be awhile away, but warehouses are now heavily automated in the rest of the world, including China. According to a report from Research and Markets, in 2015 the market size of automated logistics system in China approximated RMB 58.3 billion, up 25.7 per cent from a year earlier. Do Indian firms match up? They are not thinking drones, at least - jobs wouldn't be lost to the machine right away. "Drones on a hardware technology front cannot be costeffective, reliable as well as safe at the same time," says Arpit Dave, co-founder, Roadrunnr. However, Indian firms are using technology to optimise delivery routes and making employees more productive. They are also automating their warehouses. GreyOrange, a company that manufactures robotics systems for automation at fulfillment centres, counts Flipkart, Jabong, and DTDC among its customers. It is moments like this that stress employers as well. Delivery is a tough job. In North India, particularly, temperatures can swing between 50 degrees celsius in the summers to five degrees in the winter. It is not easy carrying 15 kg on the shoulders, and riding through potholed Indian roads, in extreme weather. But more than anything else, it is abusive customers who appear to be straining employees a lot. "Do Indian consumers understand the dignity of labour?" Sahil Barua of Delhivery asks. "You don't go to the US and have a fight (or abuse) with the cab guy. But in India, we find a lot of consumers treat delivery boys or those in blue-collar spaces with a huge amount of disrespect," he adds. On the day we meet him at his office in Gurgaon, Barua is wearing oval glasses and a black tee that says "Victory through Harmony". He talks of inharmonious situations. There have been cases where his riders have been thrashed by the customer and his friends for no fault. Delivery boys can be cheated, too, or even looted. 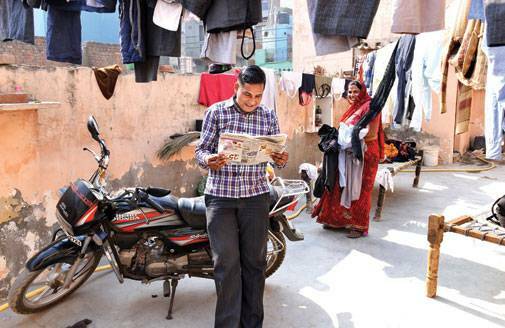 Pawan Kumar, who works as a delivery boy with Delhivery, says that in Gurgaon's Jharsa village, a few men once grabbed a packet of shoes. It had to be reported to the police and the packet was eventually returned. And making the delivery guy wait for a long time is frequent - this could impact the incentives he can make. All this needs to change for the profession to become attractive. It is easy to relate to what Barua is talking about if you spend time doing some deliveries, as we did. In all the deliveries this writer experienced, the delivery boy was never shouted at, but "disrespect" was palpable. Aajar Khan, 26 years old, works with Ecom Express. This writer pillions him as he crosses a series of farm houses, barren fields, and donkeys on his way to Park Royal Residency in Sector 22, Dwarka. He has a packet to deliver from an e-commerce lingerie brand. The one who answers the door is a man in a long red kurta and white pyjamas; the packet is for his wife. "She is in the shower. Wait". "It can take five minutes. Or even 10. Wait." Khan waits for a bit but finally hands over the packet to another lady relative in the house. A toddler is entrusted with the payment - playfully, he comes to the door and flings a Rs 500 note at Khan. The door is closed. The next delivery is at Nav Sansad Vihar in the same sector. It's a house on the sixth floor. A man in a pink tee emerges. "It's a packet for you." "It's a big packet, Sir"
"Nahi lena hai (I don't want it)"
The door is banged. In our face. The Indian Business Process Outsourcing (BPO) industry faced a similar problem in its budding years, around 2001. Indian call centre agents were often shouted at, sometimes abused, by American callers who saw their jobs being taken away. It frustrated employees but, according to Sandeep Aggarwal, a former chief marketing officer of BPO firm Serco Global Services, the industry did not really have a solution beyond counselling an employee for a few minutes. The abuses, coupled with "grave hour" shifts, kicked off a huge attrition wave - 40-50 per cent attrition in BPO was not uncommon in the 2000s. The industry learnt to live with it. Retention is already low in the delivery business. Few stick to a company beyond six months and can jump for a paltry Rs 500-1,000 hike. Does the industry have an action plan to stem attrition? Himanshu Meena is co-founder and CEO of Mumbai-based delivery company Parsel. He agrees to meet this writer at a Starbucks in Greater Kailash one Saturday morning in February. He is 26, has longish slat-pepper hair, and wears a three-piece suit. A question on attrition and his retention strategy is popped. The answer is equally eye-popping. "You don't want to have them stay longer as well," he says, in a matter-of-fact way. "Union would be a big issue always, especially coming from Mumbai. When people gather at one spot, unions are bound to form. Say 30 people who gather in a warehouse." Meena says he is speaking from experience. He faced resistance when the company's salary structure changed from fixed pay to wages depending on the number of hours one works. For an industry as young as three-four years, unions could ring a death bell. Meena may have a point but there are companies who want to build great employer brands showing employees a career path. They don't agree with Meena. Indeed, almost all delivery companies now have role models who have been promoted. Ecom Express' founder-director Sanjeev Saxena started as a delivery boy himself in 1987, in courier company BlueDart. "Competent" delivery boys in his organisation have now been promoted to supervisors as well as delivery centre heads. Roadrunnr had launched a delivery boy grad programme through which it offers courses in English and Computer Science to delivery boys. It plans to absorb top performers as trainers, quality inspectors, and trackers. Centum Learning is tasked by AskMe Grocery to run its training programmes. About 16 delivery boys crowd in a conference room one December morning. Trainer Pankaj Manak explains the company's development plan. Every city AskMe Grocery is in has city heads. Below him are zonal managers or those who manage four hubs. Then there are hub managers, hub coordinators, procurement guys and at the bottom of the chart, the delivery boy. Manak turns around to ask: "Who in this room wants to be a city head?" All of them. A few nod, some raise their hand, all of them chuckle, and then burst out laughing. The prospect of a formal career, higher wages, and a better life is good fuel to fire up aspirations.